Images of two of the Latte simulations of Milky Way-like galaxies (m12i and m12f) at z = 0. 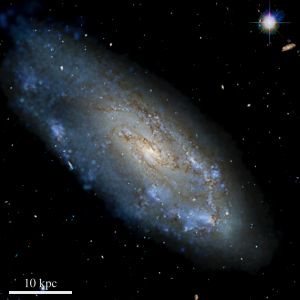 Left image is zoomed out, showing a Milky Way-like galaxy at center, a realistic population of satellite dwarf galaxies, and a diffuse stellar halo, including tidal streams and shells from disrupted satellites. Right image zooms in on a Milky Way-like galaxy at center. Mock galactic (Aitoff) projection within a Latte simulation of a Milky Way-like galaxy, as seen from a star 10 kpc from the center. Our Milky Way provides the best laboratory to study the physics of galaxy formation and to test the nature of dark matter. Excitingly, a new generation of observations is revolutionizing our view of the Milky Way: the Gaia satellite mission, Hubble Space Telescope (HST) and James Webb Space Telescope (JWST) , Dark Energy Survey (DES), Large Synoptic Survey Telescope (LSST), and a multitude of ground-based spectroscopic surveys (such as RAVE, SDSS-APOGEE and SDSS-5, GALAH, Gaia-ESO, LAMOST, PRISTINE, Subaru PFS, 4MOST, WEAVE) are measuring full orbital phase-space distributions (3D position + 3D velocity) and multi-species elemental abundances for 100’s of millions of stars in the Milky Way and its satellite dwarf galaxies. A critical challenge remains in interpreting these unprecedented datasets: the lack of sufficiently realistic (cosmological) theoretical modeling tools. To accomplish this, the Latte simulations are pushing the resolution frontier, simulating Milky Way-like galaxies at ultra-high resolution, with particle masses of 7070 solar masses and spatial resolution down to 1 pc. Thus, Latte achieves sufficiently high dynamic range to resolve phase structure in the inter-stellar medium (ISM), allowing gas to collapse into resolved giant molecular clouds (GMCs) and allowing stars to form within them in clusters. This resolution also allows us to model star particles self-consistently as single-age mono-abundance stellar populations, facilitating comparisons to stellar populations across the Milky Way. Furthermore, our new Ananke framework (Sanderson et al 2019) allows us to generate synthetic stellar surveys of the Latte simulations to compare directly against the Milky Way. This combination of (1) ultra-high resolution, (2) state-of-the-art FIRE-2 physics model, and (3) Ananke synthetic survey generation together make the Latte simulation suite an unprecedented theoretical tool for understanding the formation of the Milky Way (as well as Andromeda and similar-mass galaxies) in a cosmological context. In more detail, the Latte simulations are a suite of individual (isolated) Milky Way-mass halos that we simulated using the same resolution, cosmology, and FIRE-2 physics model. We selected them from a cosmological volume (from the AGORA code comparison project) of periodic box length 85.5 Mpc with ΛCDM cosmology: Ω_Λ = 0.728, Ω_matter = 0.272, Ω_baryon = 0.0455, h = 0.702, σ_8 = 0.807, n_s = 0.961. From this volume, we select halos at z = 0 based only on their mass (M_200m = 1 – 2 x 10^12 Msun) and an isolation criterion (no neighboring halos of similar mass within at least 5 x R_200m) to limit computational cost. In particular, our selection is agnostic to any halo properties beyond mass and isolation, including formation history, concentration, spin, or subhalo population. Each Latte simulation represents a cosmological zoom-in region around a single Milky Way-mass halo. This zoom-in region is simulated at full resolution with dark matter, gas, and stars, embedded within the full cosmological volume, which is simulated self-consistently but at low resolution and with only dark matter. The zoom-in region around each MW-mass halo is typically a few Mpc in size, and all of the Latte simulations have zoom-in regions that are uncontaminated by low-resolution dark matter out to at least 600 kpc at z = 0. Full simulation snapshots at z = 0 from 3 of the Latte simulations (m12f, m12i, m12m), including all dark matter, gas, and star particle data, are publicly available via yt Hub at ananke.hub.yt. Also available are synthetic Gaia DR2-like surveys created from these 3 simulations. 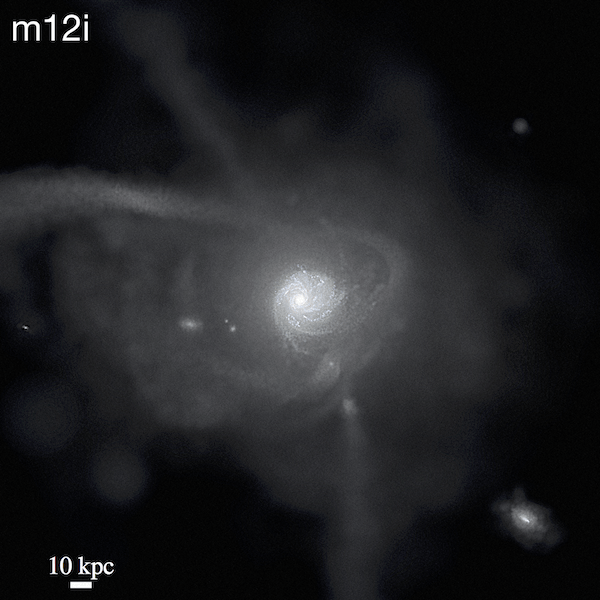 Our public release of Latte also includes data from our model for the binary black hole population in/around the Milky Way (Lamberts et al 2018), as modeled using one of the Latte simulations (m12i). This represents the first combination of a high-resolution cosmological simulation of a Milky Way-mass galaxy with a binary population synthesis model in this context. Our model predicts ~1 million binary black holes in/around the Milky Way at z = 0, with a mean mass of 28 Msun. Access our binary black hole catalog via yt Hub at ananke.hub.yt. In addition to the Latte suite of individual Milky Way-mass galaxies, our full FIRE-2 simulations suite also includes simulations of Local Group-like volumes, which include a pair of Milky Way + Andromeda-mass galaxies at their measured masses, relative distances and velocities. These Local Group-like volumes extend out to several Mpc to model the low-mass (dwarf) galaxy population on the Local Volume. Shea Garrison-Kimmel is leading this “ELVIS on FIRE” simulation suite (which is an extension of his previous ELVIS suite of dark-matter-only simulations). ELVIS on FIRE has similar (even better) resolution than the Latte suite: baryonic particles of just 3500 – 4000 solar masses. See Garrison-Kimmel et al 2019 for more details on ELVIS on FIRE.